Enter Steamboat Willy, the first Mickey Mouse cartoon and the first animated short by Walt Disney in 1928. 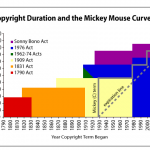 Under the 1909 Copyright scheme, the Mickey Mouse character had copyright protection for 56 years (with the renewal), expiring in 1984. With the impending loss of copyright on it’s mascot, Disney is said to have begun serious lobbying push for changes to the Copyright Act. Through lobbying, they got Congress to pass an extension of copyright to 75 years in total. Notably the law also stated that, no matter what, works published before 1922 – the year before Steamboat Willie of course – were in the public domain. That was also key to Disney whose whole business model was developed on doing animated versions of public domain works like Cinderella, Sleeping Beauty and Snow White. That law for example made clear that The Little Mermaid, published in 1836, was public domain. But that only got Disney to 2003. So in 1998, Congress again changed the duration with the Sonny Bono Copyright Term Extension Act. This legislation lengthens copyrights for works created on or after January 1, 1978 to “life of the author plus 70 years,” and extends copyrights for corporate works to 95 years from the year of first publication, or 120 years from the year of creation, whichever expires first. That pushed Mickey’s copyright protection out to 2023. What will they come up next? What’s curious is that Disney’s mouse is also a trademark and therefore has no expiration date. As long as it continues to be used in commerce “Mickey Mouse” the name and the iconic character we all know is safe from duplication due to trademark law. It would only be the storylines that fall into public domain and those are almost all already in the public domain or still subject to the long extensions under the Bono Act. Congress’ assistance to Disney, however, has muddied up Copyright Law and kept out of the public domain works that should have long passed into it. In an interesting article by Techdirt published in Above the Law, the authro details how the Disney laws caused delays in publishing Barracoon, written in 1931, based on interviews anthropologist Zora Neale Hurston did with then 86-year-old Cudjo Lewis, then the last known living person to have been brought to America from Africa on a slave ship. It took years and years for the authors to be able to find who owned the rights to the 1931 interviews which should have long passed into public domain. Works by countless authors and artists from the 1930s through the 1980s will be essentially “lost” works because anyone trying to re-work or re-publicize them will have difficulty getting copyright clearance. Art is supposed to develop by people being inspired by previous works and giving fresh looks and insight into already published works. The Disney-friendly copyright laws stifle that creativity and leave countless works on the shelves. We need to make sure that as 2023 approaches we can finally end the protection and say to Disney – you had a good run, time to let it go. On the topic of copyright, what is the current state of 17 U.S.C. 512(f) ? Is it a toothless remedy at this point ?